Siopao Heaven: Takipsilim: Blessing or Curse? Flowell officially declared the news of the Filipino Twilight remake a hoax! ABS-CBN REMAKE OF "TWILIGHT" A HOAX! Last December 23, nilabas ni Edgar Cruz ang article about sa remake ng ABS-CBN ng movie na Twilight, and the same time Perez Hilton releases his version of the clamor where everyone were furious about the idea. 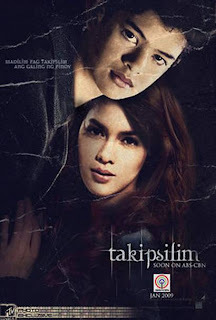 This morning i received an email from Tito Ed Cruz of Yehey.com regarding the updates on the alleged remake/adaptation of Twilight, with the local title Takipsilip where Rayver Cruz and Shaina Magdayao will be the main cast. “Di ko alam ako pala magdi-direct ng ‘Twilight,’” director Cathy Garcia Molina curtly replied when Buzzbox asked her if she is opting for a localized version of the blockbuster vampire novel. The buzz is that ABS-CBN had acquired the rights to the novel for US$1 million and that Cathy has been selected to direct it with Rayver Cruz as Edward Cullen and Shaina Magdayao as Isabella Swan. Cathy informed Buzzbox her schedule is heavy as she has to finish principal photography and post-production of the John Lloyd Cruz and Sarah Geronimo starrer “A Very Special Love 2,” Star Cinema’s Valentine offering, before she could work on a new project. Could this don’t-know approach be a ruse? I got this idea when Carlo Orosa, the manager of Karylle as Rosalie Hale, originally answered “Wala pang official.” When asked for a clarification, replied, “Can’t be revealed yet.” Could it be the whole project is still a top secret and people in the know were asked not to talk about it. This may be similar to the information embargo ordered by ABS-CBN top management for “I Love Betty La Fea” as to the actor who would play the role of Armando. This turned to be John Lloyd Cruz which Buzzbox correctly second-guessed. There are strong reactions from ‘Twilight” cult fans that a petition for ABS-CBN not to proceed with the project is on-going. The petition centers two issues: ABS-CBN’s lack of ability to do justice to the novel and Rayver not being fit to do the Edward Allen part. Before they do this, they have to find out first if the buzz is for real or a hoax? The original article on abs-cbnNEWS.com has already been deleted and the guy who posted that probably got slapped real hard. i couldn't agree less with superbitch..